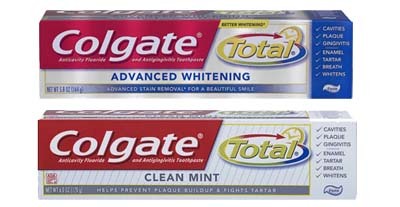 Take better care of your whole mouth with Colgate Total. Its unique, clinically proven formula creates an anti-bacterial barrier on teeth,tongue, cheeks and gums, providing 12 hour protection for 100% surfaces of the mouth to prevent common oral problems. Hey Buddy!, I found this information for you: "TOTAL 12". Here is the website link: http://agc.com.af/total-12/. Thank you.